Closing in on 100 years in business, Empire Level, Mukwonago, WI, has made its name as a top worldwide supplier of layout and measurement products such as levels, squares, utility tape and more. In 2014, Milwaukee Tool acquired the company, and since then, Empire Level has embarked on a $16-million investment in its workforce and equipment. That it is. On the people side, Empire Level embarked on implementing a culture shift by increasing training opportunities, streamlining internal processes and implementing surface improvements including a new paint job for the company’s 140,000-sq.-ft. manufacturing plant. More than 200 employees operating across three shifts call Empire Level home, and the company has “sold” its products to these internal customers by using its marketing team to demonstrate the products and explain their quality and performance features. Buy-in was central to moving the company forward. Empire Level’s transformation also included updating processes and replacing old production equipment that was no longer efficient. Milwaukee Tool bought the company precisely to manufacture products in America and continue to compete globally, so using outdated equipment was not an option. One of its newest pieces of equipment is a custom 450-ton hydraulic press from Beckwood Press, St. Louis, MO. 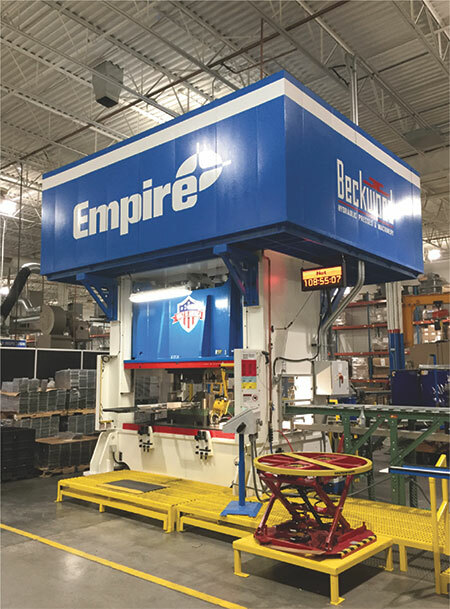 Empire Level needed a complete forming solution that could integrate with its existing die-transfer system and accurately form precision rafter squares using progressive dies, according to Steve Lallensack, Empire Level’s director of operations. Besides eliminating the mechanical and maintenance issues caused by the older equipment, the new press offers production flexibility and process repeatability. The resulting gib-guided press features a 60 by 100-in. bed as well as magnetic platens, die rollers and lift-off die consoles to facilitate quick die changes. Its structure is engineered for long life using finite-element-analysis testing, according to Beckwood officials. Empire Level’s arsenal of machinery includes both mechanical and hydraulic presses. It relies on the hydraulics to assist with heavier coining operations while the mechanicals tackle more straightforward punching and stamping jobs. This diverse mix of machinery gives Empire Level process efficiency and part-to-part repeatability. In production since January of this year, the new hydraulic press primarily forms 1⁄8-in-thick extruded aluminum to produce multiple versions of rafter squares that range in size on either side of 1 ft. long. Weekly volumes range from 3000 to 25,000 parts depending on the model number, according to Lallensack. Well-known characteristics of hydraulic presses—dwell time and stroke-speed control—made this type of machine the best option for Empire Level. The new press indeed has provided the reliability and productivity that Empire Level had sought, and the company continues to make headway in reliability in other areas, including the press tooling. Empire Level contracts with local companies for tool build and significant maintenance, while performing preventive and more routine maintenance inhouse. Lallensack points to the ability to have a press built exactly to its specifications as key in the success of the upgrade project. Besides the investment in people and equipment, Lallensack also attributes Empire Level’s growth to the Milwaukee Tool acquisition, which has provided access to that company’s expansive worldwide customer base.